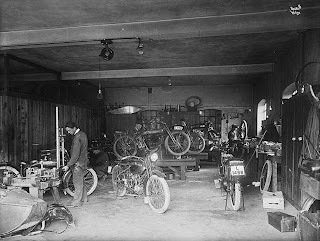 Harley repair shop in early twenties at "Majorstuen" in Oslo. The bike in the middle is a Harley sport with in line boxer engine. Our former King Olav used to own one of those. Somewhere I have a photo with the then prince Olav and his Harley.